A small pinto foal calls for her mother in a crowd of wild ponies. Her baby face caked with Assateague marsh mud, she’s on the verge of panic. Her mother whinnies in response. 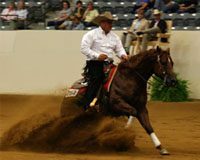 The filly breaks into a frantic run, crashing into her mom, bouncing off her side, then shoving her muzzle underneath the palomino pinto mare to nurse. The foal’s scrubby tail flicks away a fly and she exhales. It’s been a long, hot few days for the little filly: her first round-up; her first swim across the brackish Assateague Channel to Chincoteague Island; and her first parade down Main Street to the carnival grounds. For now, it’s time to rest with the herd in a large corral behind the grandstands. The carnival’s teacup ride, Ferris wheel and cotton-candy machines sit still, but the corral is abuzz with ponies—squeals, nickers and sharp kicks ring out. Stallions, in much closer quarters than usual, keep a close watch on their mares. 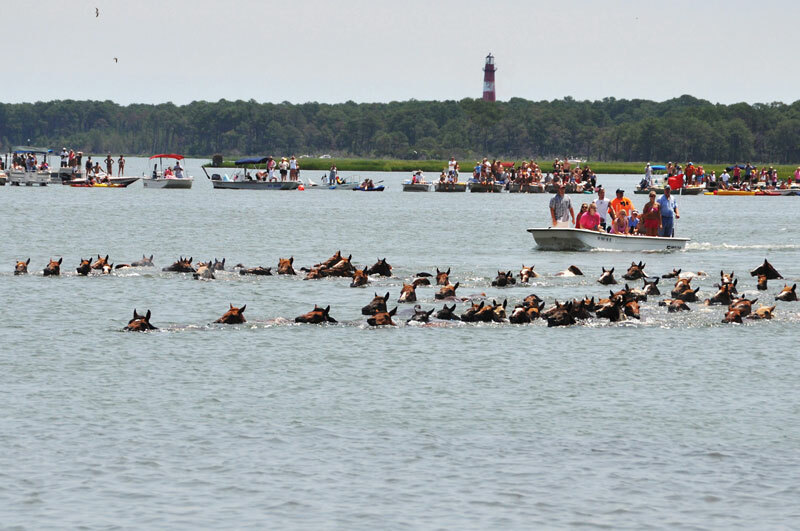 For thousands of onlookers, it’s a first chance to see the famous Chincoteague ponies up close. People hang over the fence admiring the ponies and snapping photos. Assateague and Chincoteague are coastal islands. Assateague is the 38-mile-long barrier island shared by Maryland to the north and Virginia to the south. A wildlife sanctuary, Assateague is a lovely world of sun, sand and sea grass for the ponies and other animals that live there. Across the bridge is the bustling island town of Chincoteague, with restaurants, motels, bed & breakfasts, and the usual assortment of local businesses. 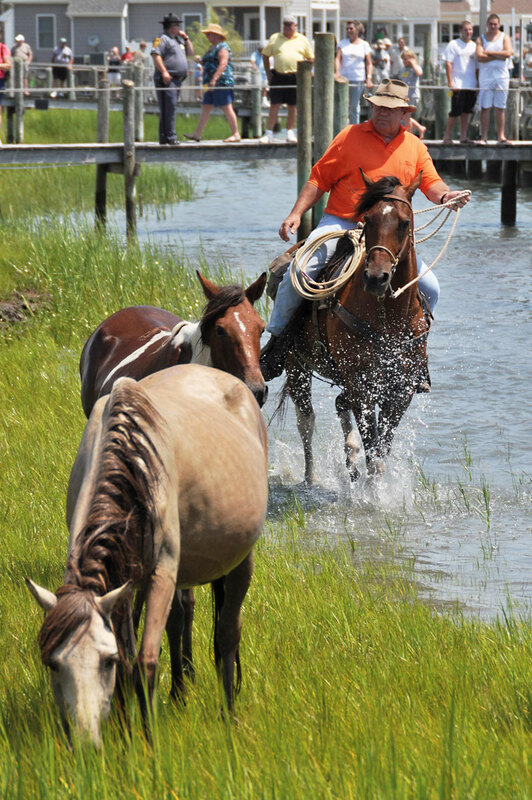 2014 marks the 89th annual swim, which headlines a week of pony penning events on the islands. 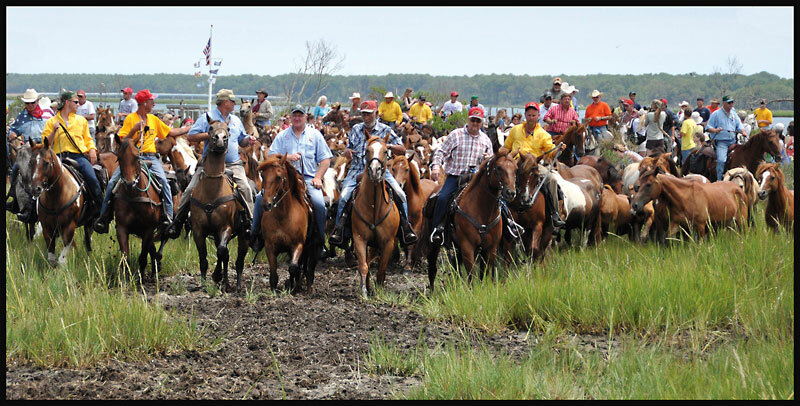 It starts with a round-up of the approximately 150 ponies on the Virginia side of Assateague. 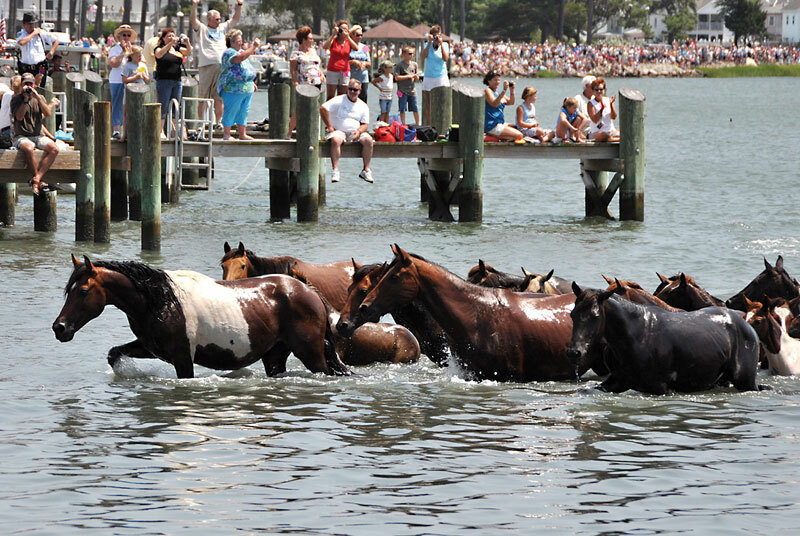 Herded by a gang of “Saltwater Cowboys” (the horsemen who do the round-up, many of them volunteer fire fighters), the ponies swim across a narrow section of the channel to Chincoteague, where they receive a vet check and get a brief rest before the parade and the next day’s auction. Each night, visitors to the island enjoy the Chincoteague Volunteer Fireman’s Carnival. About 50 foals get sold each year to raise money for the Chincoteague Volunteer Fire Company (CVFC), which owns and manages the herd. Selling foals also helps to keep herd numbers manageable. The pony penning tradition on the island started three centuries ago with scheduled round-ups as a way for owners of livestock, like horses and sheep, to manage their herds. By the early 1900s, a busy tourism industry had built up around the penning activities. Motels and restaurants opened, catering to thousands of visitors who came to the island for the fun. In 1925, the town held a carnival during the round-up to raise money for the CVFC for the first time. Eventually, the carnival grew to include the selling of a handful of foals. Stories about the pony swim began to draw people from all over the country. One of those people drawn to the island for the pony penning was children’s author and horse lover Marguerite Henry. Her visit inspired her to write the book Misty of Chincoteague, which became a beloved classic. Published in 1947, it tells the story of brother and sister Paul and Maureen Beebe, and their adventures in raising a wild Assateague Island-born filly named Misty. The story is based on real ponies and people. The real Misty was born on the Beebe Ranch in Chincoteague, sired by a stallion named Pied Piper and out of a dam named Phantom. Known for the large white patch shaped like the United States on her side, Misty lived with Henry in Illinois for 10 years and toured with the author, making many public appearances at schools, museums, libraries and horse shows. The Beebes—Maureen, Paul and their grandparents, Ida and Clarence—lived on the ranch on Chincoteague where Misty was born in 1946. Misty returned to the ranch in 1957 and later had three foals: Phantom Wings, Wisp O’ Mist, and Stormy. Misty died in 1972 at the age of 26. Henry’s Misty of Chincoteague was followed by two other books—Stormy, Misty’s Foal and Seastar: Orphan of Chincoteague—and was made into a movie in 1961. Last summer, I sat on a pier for hours on the Chincoteague side of the channel waiting for the 2013 pony swim to happen, watching the salty tide ripple and sneak in. Spectators filled the marsh, some bobbing on kayaks and rafts, and others standing or sitting in lawn chairs half-submerged in the channel water. Others avoided the sun in makeshift hammocks under the piers. Boats anchored in the channel formed a lane the ponies would swim through sometime soon. We were all waiting for the magic moment to happen. The timing of the swim is all about “slack tide.” That’s the 30 minutes or so between low and high tide when the current stills. It’s the easiest time for the ponies to make the five-minute trek. At about 11:30 a.m., just as the Saltwater Cowboys signaled with red smoke that the ponies had been driven into the water, black clouds crowded the sky. Cold rain pelted ponies and humans alike. I couldn’t even keep my eyes open. How could the ponies swim like that? They swam fast, only their heads breaking the surface of the gray water. The first ones to scramble up onto the marshy banks turned around before shaking out their manes to see how the others fared. Over the next few minutes, 150 horses pawed their way up onto solid ground. They shook, snorted and regrouped without injury. The storm moved out as fast as it had come in. By the time the ponies clip-clopped and cavorted down Main Street in the parade to the carnival grounds, the sun was shining again. Denise Bowden, public relations officer for the CVFC, summed up the morning best, her voice booming over the loud speaker: “The mud will wash off, but the memories will last forever,” she said. Spirited and surefooted, the Chincoteague pony likely traces its origins to mixed breeds of horses and ponies released to graze on Assateague. Many believe it’s a descendant of Spanish horses that survived a shipwreck off the coast of the island. Two herds of wild horses live on Assateague, separated by a fence at the Maryland-Virginia line. The ponies in Virginia are managed by the Chincoteague Volunteer Fire Company, which provides vet and hoof care during two other annual round-ups and hay during harsh winter weather. The Maryland ponies are managed by the National Park Service. The ponies that live wild on the island have large bellies from the abundance of salt in their diet, as they eat primarily marsh grass with a high salt content. Today’s Chincoteague ponies are stocky equines with thick manes and tails and a bit of feathering over strong hooves. When domesticated, the Chincoteague pony is known for its “puppy dog” temperament and makes a good all-around riding horse. 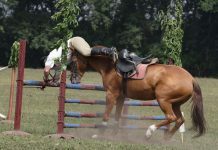 For more information, visit the National Chincoteague Pony Association at www.pony-chincoteague.com. This article originally appeared in the July 2014 issue of Horse Illustrated magazine. Click here to subscribe!